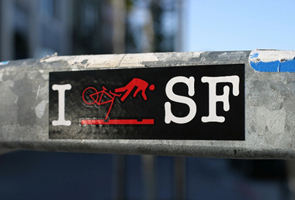 After living and biking in San Francisco for a good amount of time, we will undoubtedly hear at some point, “I crashed SF train tracks!” or we will ourselves succumb to the treachery of the tracks. I casually surveyed 20 folks that I know that ride bikes including Nellie and myself, and about 8 have been victims of accidents on SF’s train tracks. Albeit a small sample size, that’s a 40% rate! Well, if there are 72 miles (116 km) of light rail tracks in a 49 sq. mile (127 sq. km) city and the main artery is like Market Street, a major corridor for bike commuters with rail tracks throughout, it is very likely anyone who rides a bike more than a mile on any given day will have to cross a train track. These tracks are very treacherous in that the size between them is just enough for a bike tire to fit, not to mention their surface is very slippery. So if a bike tire is not getting caught in them, the tire is gliding on them. Cyclists have to try to cross them perpendicularly, which is not always easy to do and on wet days, they must ride slowly and cautiously to ensure their tires don’t lose traction as they cross them. 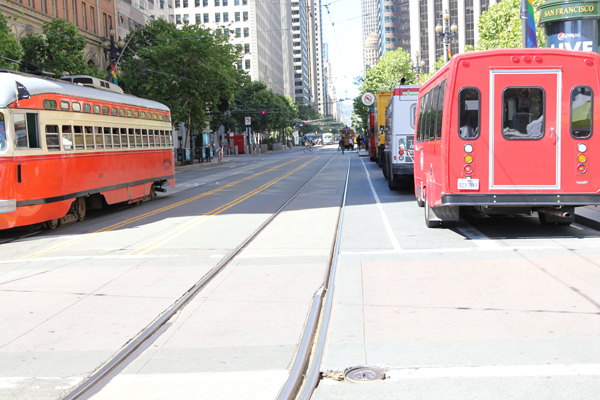 Multiple sets of MUNI light rail tracks on 25th at 3rd St. 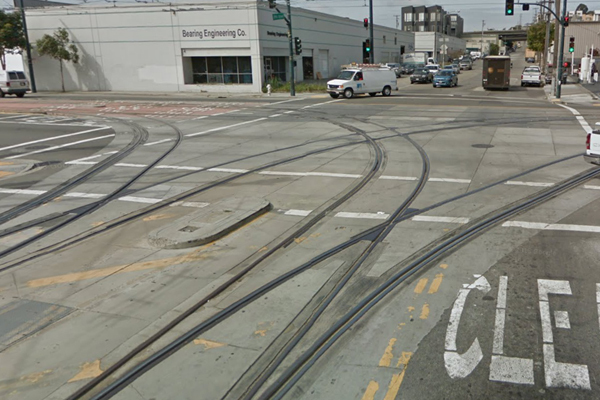 Here is an example of the kind of tracks we have in SF. The photo above was taken at the corner of 25th St. and 3rd St. in the Central Waterfront neighborhood. Those myriad of rails just makes my heart beat 10 times faster whenever I cross them. What if you have to make a right or left turn there, your turned front wheels could easily become aligned with the angle of the curved tracks. MUNI light rail track on Market St. near Steuart St.
Then there is this sort of infrastructure where a cyclist has to share the vehicle lane with light rails and vehicles. 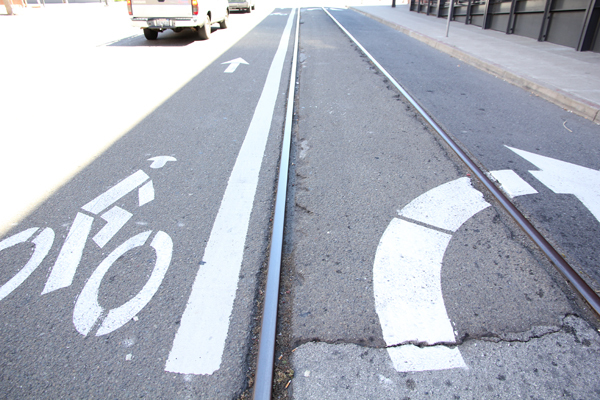 What do you think are your chances of getting your bike’s front wheel caught in the tracks? Riding between the tracks is like a balancing act. I have seen a few that crashed, especially at Critical Mass (this is usually the route Critical Mass takes when first starting out from their meetup spot). 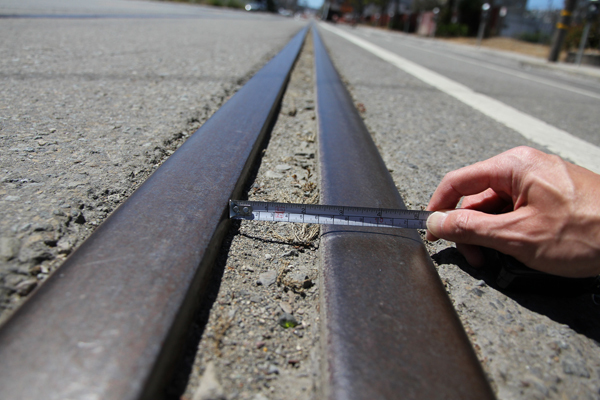 The gaps for light rail tracks are about 1.5 in/38 mm (on the straights) to 2.0 in/51 mm (on the curves) wide, so most tires on bicycles of SF would get caught in them. As much as I do not want to encounter train tracks when riding a bike, if I want to live in a city with good public transportation I will have to accept it. However, train tracks that are actually still being used are not as problematic. It is the train tracks that have been abandoned but still left in place that need to be removed. They pose a great deal of hazard to many cyclists for a couple of reasons. They were put down before bike lanes and sometimes even before proper paved streets were put in. Secondly, because they have been abandoned, they are left to die (eroded) creating more dangerous hazards adjacent to the such as eroded asphalt and potholes. I don’t know how many cyclists have crashed on abandoned tracks versus active tracks but both Nellie and I have been victims of the abandoned variety. 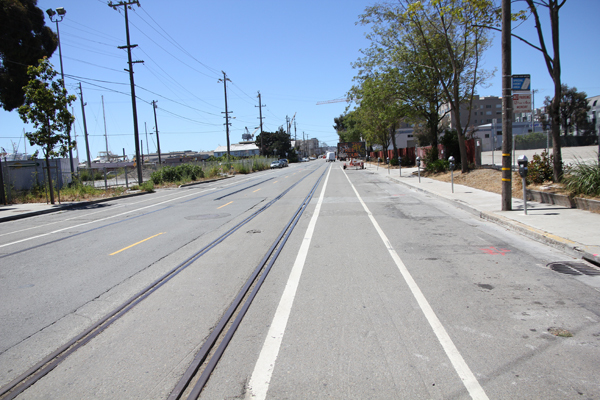 A block and a half of abandoned train tracks on Townsend St.
One of the major routes for bike commuters to get from the central neighborhoods to the Caltrain Station and Embarcadero is Townsend St. Recently, I counted about 13-45 bike commuters every 5 minutes during peak hours on Townsend St. heading in the direction the photo (see above) is taken. You can see that the track is located only a few inches from the bike lane. A group of cyclists arriving together to a red traffic light can force anyone of them onto the rail. Also, there is not one street lamp on the right hand-side of the sidewalk. It is pretty dim at night at that section. Fortunately, bike commuters that come home at night usually go in opposite direction where there are street lamps and no tracks to worry about. Erosion of cracked pavement on both sides of the abandoned tracks on Townsend St. Unfortunately, Nellie took that direction one night riding home. It was about midnight and it was dark along that stretch. She crossed the first track fine to merge into the right turn lane (see photo above) but the eroded pothole next to the track caught her front tire and she fell flat on her face. She was completely dazed, and I didn’t want to take any chances so an ambulance was called and she was driven to the ER. Yep, she got a loose tooth, a few stitches on her upper lip, plenty of road rash, and a bruised forehead. Just looking at that stretch, it would take an experienced rider with a little luck on his side to cross those double tracks with little room to straighten your bike out again. I think probably it’s best to slow down as much as possible to a walking speed to merge, or to make a sharp right turn at the crosswalk so you go more perpendicularly over them, but you’ve got to watch out for autos behind you in the right turn lane. A close-up of a cracked pavement that developed into a pothole. My shoe is placed there for scale. I believe this is one of the potholes which Nellie’s bike tire got caught in that night. As you can see, my shoe size is 10.5 in (267 mm) and can easily fit into that pothole. You can cross the track but that pothole next to it can eat your bike alive. Another set of abandoned tracks on Illinois St.
Another part of town that has these abandoned tracks is Illinois St. that runs about 1 mile (1.6 km) long. Yep, that’s a mile in length that you need to keep paying attention to freight trucks, cars, large debris, construction detours, and these nagging tracks that do not need to be there. How inconvenient and dangerous is that? Oh, and Illinois St. is the flatest bike route to go through the eastern neighorhoods. During Bike to Work Day this May, I witnessed two colleagues who were riding down right in front of me on this very same route. Both of them were forced to cross the abandoned tracks due to a construction zone blocking the bike lane and both of them crashed. A 2.5 inches (63.5 mm) wide gap between rails of Illinois St.
Not even a typical fat tire from a Dutch city bike is going to save you from getting your front wheel jammed into it. 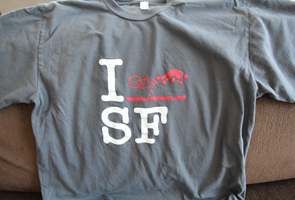 If you’re going to get fat tires wider than 60 mm or so, you’re not going to have a good time riding in SF. This turned track extends right on the bike lane on Illinois St. This pothole is near a crosswalk on Illinois St. at 16th St. It could be a hazard to both pedestrians and cyclists. 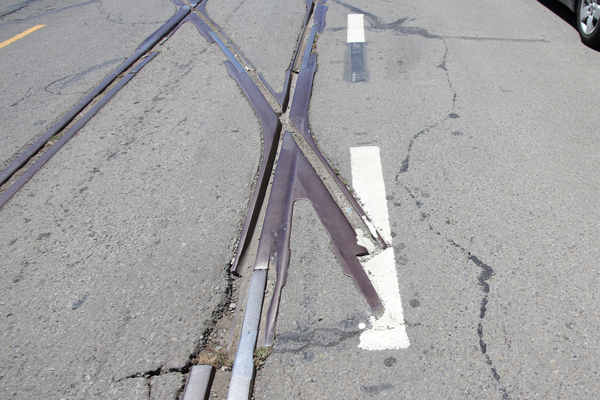 Well, knowing how SF crawls like a turtle when it comes to infrastructure maintenance and installation, here are some tips that I gathered and learned to avoid train track crashes. Please comment if you have other recommendations. 1. Rule of thumb, cross the tracks as perpendicularly as possible. 2. Do not lean on your bike when crossing. I leaned on my bike and that’s how my bike accident happened. 3. Try to sit upright as much as possible when crossing, even if you have low handlebars, so your center of gravity is more balanced and if you crash you are less likely to land on your head. Or better yet, get an upright or step-through bike. 4. If you ride at night often, invest in those super bright headlights so you can see the ground better. 5. Get wide tires that are at least 35 mm. 35 mm becomes wider when you are seated on your bike because it expands with your weight and that is wide enough to not lodge into active train tracks. Just be careful on the curved tracks because those are 51 mm wide. But what about in the rain? The metal surface of the tracks gets even more slippery when wet. I don’t know except to use the above tips with very extra care and maybe buy some good tires made for rain. 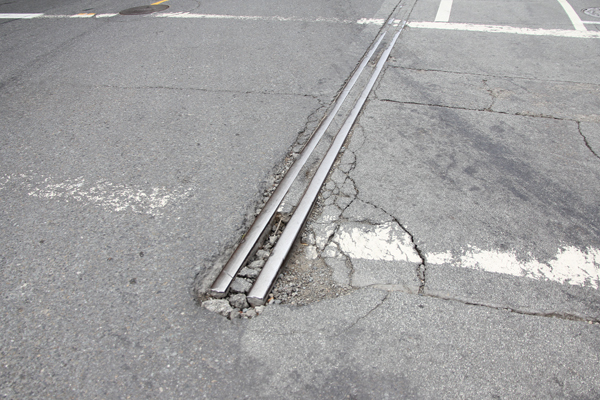 SFMTA, you gotta remove those abandoned train tracks! Just want to say you can be sued. ‘Eastern SF’ [Hampton NH USA] washed up sea debris repeals rapid reflexes no traction… Rocky Asphalt Roadrash. A ‘Bisection’ equals half a pothole on cracked eroded tarmac edges. The 700Cx42MM Rubber shall be replaced with 47MM. Yeah that bike lane in Townsend is right next to those tracks. I don’t even bother riding (unless you have wide tires in the 40MM-plus category) whenever I am forced to moved over to those tracks–I just get off my bike and start walking until it’s clear again. I saw three cyclists fall during Critical Mass because of train tracks. (Luckily they were okay but we’re embarrassed I’m sure.) When I rode on Market St. a few weeks ago, I was forced to move over to the tracks due to buses parking on the right side so I just started walking/running with my bike it until it was clear to ride again–I didn’t wanna risk the injury and embarrassment…But the city should do something about those tracks that are no longer needed, they are definitely a safety hazard to cyclists. It was rainy today and I got taken out by the townsend tracks 5 feet from my office. I guess I can wear the t-shirt now. Now, you are part of the 40% statistics. Thanks for the link. 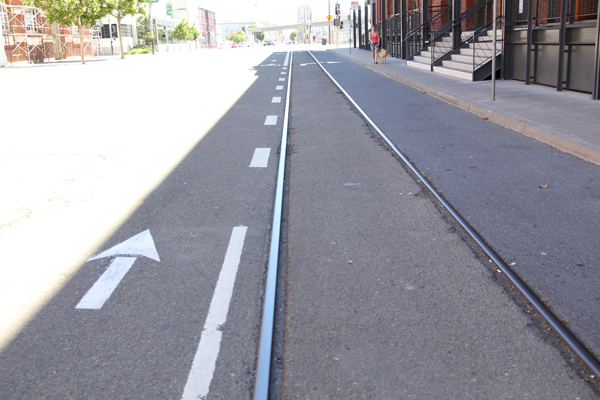 I didn’t know Caltrain was responsible for the abandoned tracks on Townsend and they will repave Townsend street too?! Here is an excerpt from the article for others to see. Another good funded capital project this year will removed unused rail tracks in Townsend Street and repave Townsend after the rail removal. 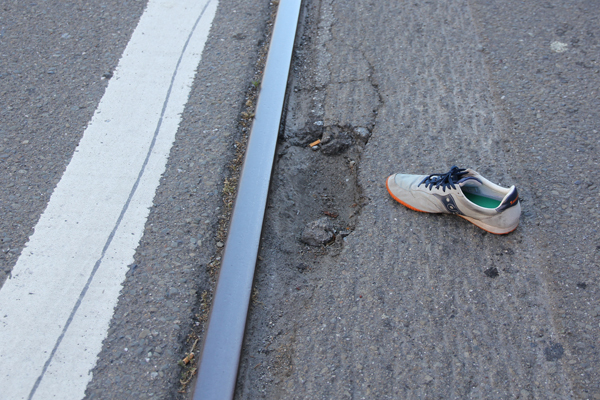 The tracks are a hazard to cyclists and others. I crashed on the tracks on Market many, many years back — on a scooter! My bf was driving but neither of us were aware of the dangers of tracks and who would think fat scooter tires would be a hazard but sure enough, it didn’t take much and we went down hard. Luckily we were both wearing helmets. I somehow escaped without injury by duck, tucking and rolling out of the accident and thankfully there were no cars following closely behind. But my bf broke his knee because the scooter landed on it. Ever since, I treat tracks with the utmost respect and always cross at a 45 degree angle. Fat tires are also extremely helpful but even my fat tires still slip on tracks because of the oily car fume film or dampness which makes them uber slippery. Ride safe friends!! That’s the first I have heard a scooter crashed on a train track. These tracks sure are immune to all sorts of two wheelers. “Sometime in early October we will start the track removal along Townsend (track currently outside the Caltrain Right of Way). The contractor plans on closing 7th Street for an extended period (3 to 5 consecutive days) with a complete detour in place. Traffic going West along 7th will be detoured through King and around to Townsend. Thanks for the head’s up. A lot of people will be looking forward to this change! I will try to get some coverage on it. How do you like the BABS? I hope they improve beyond the track removal, repavement and striped bike lanes. That stretch has attracted many bicyclists. I am starting to see a few people on bikeshares taking that route too! Don’t remove the tracks, you just need to ride your bike better. The track isn’t the problem, having streets dominated by automobiles has made a mess, look at this Spanish movie from 1908. Also when you are on a bicycle it’s not a race, you have to look out for us pedestrians too! Well, I guess you can add me to the list of victims on the Illinois St tracks. I tried to cross the tracks to avoid a van parked in the bike line, and went down quick. At least I now know that I can get a t-shirt to go with my broken tibia and knee brace. Hahaha, welcome to the club.